Did a local designer come up with a better version of Novare's designs? You decide. 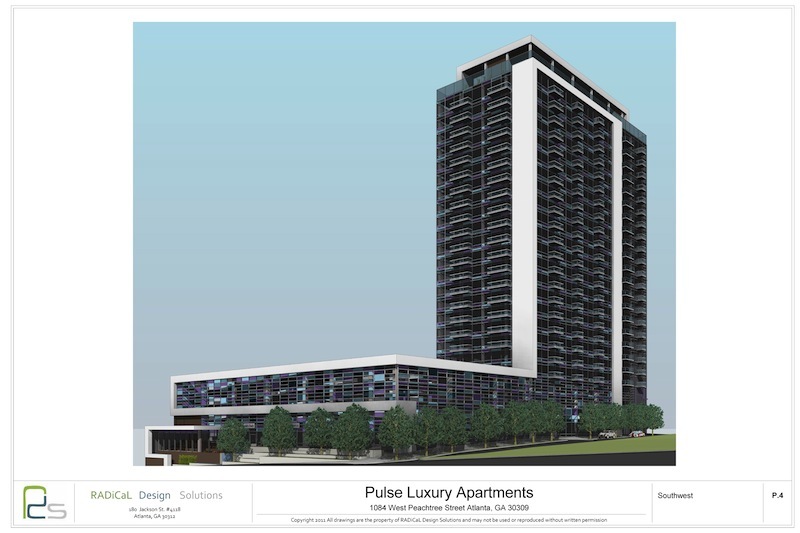 Kyle Benedict, owner of Radical Design Solutions, has gone through the trouble of redesigning Novare Group's proposed 320-unit luxury apartment tower on West Peachtree Street. But get this: he has no involvement with the project. So why did Benedict do it? Because he's disgusted with Novare's designs. He even approached Matt Smith, senior vice president of development for Novare, with his redesign but never heard back. Below is a side-by-side comparison of Novare's design (SkyHouse) and Benedict's design (Pulse). You can see the entire plans by clicking here for Benedict's Pulse proposal and by clicking here to view Novare's SkyHouse proposal. Copyright 2011 -- All drawings are the property of RADiCaL Design Solutions and may not be used or reproduced without written permission. string(44) "1084 West Peachtree St NW, Atlanta, GA 30309"
The redesign looks much better! Agreed. The redesign looks much better. More modern and sleek and the parking garage blends in with the building rather than looking like the typical steel and concrete eyesore that most end of being. Look, it's mirrored glass on yet another highrise proposal. The smoked glass gives it a mysterious feel as well as reducing the intensive glare of the sun. Way to call the designer out. Hands down the redesign is outstanding ! A beautiful city like Atlanta needs a beautiful design and the colors within this structure are as exciting as the name "pulse" love it love the new designer / architect ! Many kudos to being outside the box ! Novare should hire Kyle Benedict. What's wrong with Novarre?? Yet another clone building with a hideous concrete parking deck. Someone please take away their permits for all buildings and give them to this guy!! Kyle Benedict here.... I'd like to thank those that have commented so far and look forward to more. I would just like to say I completely understand design is subjective and, just as myself and many WNA readers did not like Novare's design, I don't expect everyone to like mine (even though they should- kidding!). I do encourage everyone to look at the PDF link though which is the actual powerpoint I gave Novare. That really explains the differences in the designs and where I think their design fails and mine creates potential. Regardless of what the building looks like aesthetically, I think incorporating the certain elements that I did (reducing P deck size, more retail, pedestrian plaza, etc.) benefit the local community, the residents of Atlanta, and the city itself which- in addition to making money- should really be a goal of developers. Obviously, since I did this on my own time with no expectation of compensation (though I did try! ), that is a goal of mine as a designer while creating something appealing to the eye. Unfortunately SB's comments are closer to the truth- a developer recycling a very basic design over and over again to increase developers profit margin. Kyle, your design is leaps and bounds above the other. Novare's design is, unfortunately, another addition to the recent collection of mirrored buildings in this city. There's been very little imagination used in high rise architecture here in the last handful of years. I'm glad to see you don't want to be in the norm. Your design is striking. Pulse IS a much more desirable design. But aside from bruised design egos at Novare, I believe the proposal's wording is to blame for the lack of response. Page 3 "unfortunately “Sky House” sounds like something my uncle built my 8 year old cousin in a tree in their backyard." Page 4 "Obviously I took a more modern approach". If I were to receive a proposal with that type of tone, my first thought would be "Who's this tool?" followed by "Where's the trash can?" It's a shame Kyle's proposal wasn't worded more professionally, because his ideas are great. Considering this development borders our office property, we have a particular interest in the design. 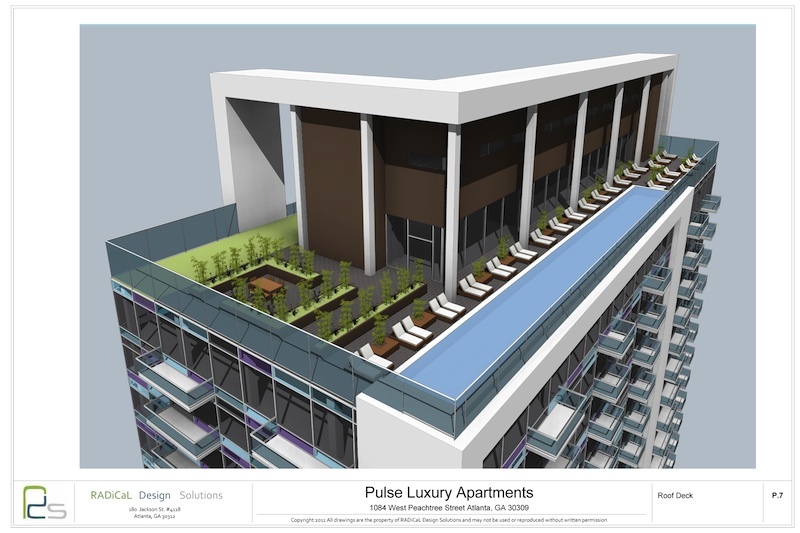 Prefer Kyle's design -- nice evolution of the Novare designs in Midtown and Buckhead. You are correct... unfortunately I don't have a degree in PR, only architecture. I often speak in heavy tones of sarcasm with (attempted) humor and that has gotten me in trouble more than once. I'm no Larry David (social assassin for you Curb fans!) but I often don't hold back on how I feel about things either (I am from New York after all). If I ever do this again your comment has been noted. Less tool, more professional. I appreciate it. I agree the Pulse design is better BUT it's not within the same budget as Skyhouse.The glass fenestration on the parking deck is just one example of increased $$$. KB may have been more successful in getting Novare's attention if he had presented something of similar cost to the Skyhouse design. Regardless, I applaud his efforts. It would be nice to see Novare put away their "cookie cutter." I bet they'll stamp that horrendous cookie cutter all over the skyline many more times before it is retired. It all comes down to building for maximum profit and minimum cost...they don't care if it looks like crap. I hope Novare takes advantage of some free design work and thinks better of their original design. That said, it's no shock that Atlanta, a cookie-cutter city, would play host to yet another cookie-cutter building. Novare should not be given a permit to develop anything in this city after the aesthetic destruction they've caused (save for the Atlantic) over the past 5 years or so. Everyone of their buildings looks like it came out of a high-rise kit, and there is virtually no attention to detail in their projects. This design is considerably better, save for one element - the parking garage. Build underground, or at a minimum build internally and hide it from the street view. Would it be too much to ask to actually get something architecturally creative in this town too? Novare needs to think out of the box. I was in the market for a condo recently, and was sorely disappointed at their inventory of lackluster, boring, cookie cutter condos. They lack creativity and soul. 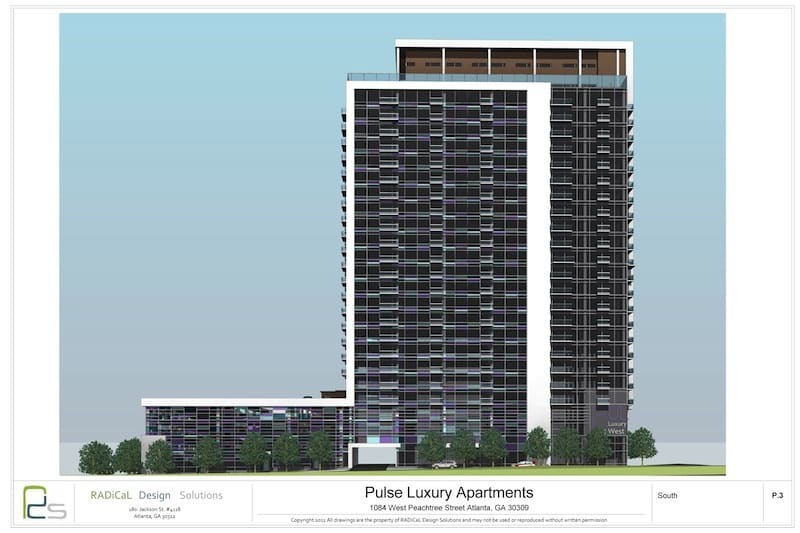 "Pulse" is clearly much more esthetically pleasing and considers the impact environment and aesthetics have on the residents and surrounding community. I understand that Novare has an ROI they are looking for, but I still think they can find a solution that will maintain cost while still being imaginative. Wow what a breath of fresh air! My favorite part of the revision is the Spring Street facade. It's nice that you actually took time to improve the streetscape there instead of just making it even more hellish, like Novare will do with their current design. Also, I love the graphic quality of the white band that starts on the ground, goes to the top, and then wraps around the back. A simple but powerful gesture. In some ways this reminds me of one of my favorite glass condo buildings, Midcity Lofts, which is just down Spring Street. Not that this really resembles that building, but both are variations on a common theme (glass condo) that come off as so much more thoughtful than typical Novare thanks to a few details. Bravo, I applaud KB's efforts and hope other architects out there will follow suit to get the developer's attention. I personally don't like those dark windows, but the overall structure is MUCH more appealing. I'd be interested to see what the interior designer would do with this building. Hopefully the developers will re-visit the original Skyhouse and at least make some adjustments. People have been saying from the beginning that an unattached parking structure was a terrible idea and they were right! For a man that prides himself on handicap accessible design, his roof deck design seems to proclaim that people in wheelchairs have no right to access a pool. Not sure what you mean by your comment... the pool is actually raised off the ground which would make it easier to transfer to the pool edge from a wheelchair rather than having to go down to the ground, building a pool ramp, or having to integrate a pool lift for people with disabilities. It is definitely something that could be explored further but since this is very much a schematic rendering, it is not something I spent a great deal of time on. I was looking more at the big picture first. Of course you did fail to mention I included accessibility to all 3 tiers of the plaza but that's ok. I have been looking forward to your commentary since you are by far the most outspoken WNA reader. I completely agree that hiding parking would be the most ideal solution. I have no idea how much it would be to excavate that site especially if it is all granite as people mentioned in the other article. And, in keeping with my initial plan to restrict my design as close to Novare's as possible (with similar heights and such), I tried to create a parking deck that complemented the building, had SOME sort of aesthetic appeal, and appeared to be not sitting so heavy on the site. I would like to know how much Novare paid their Architects who just got waxed by an intern. If Novare wants to truly make a successful urban apartment building they will have to put in money. If they go bare bones (pour sound attenuation, poor building design, poor connection to the street level) it will experience high levels of turnover resulting in lowered rents which will equal a poor clientele. If Novare has any sense at all, they will spend the few extra dollars to make a better design, and apartments that are more than the code minimum (especially in regards to sound attentuation). 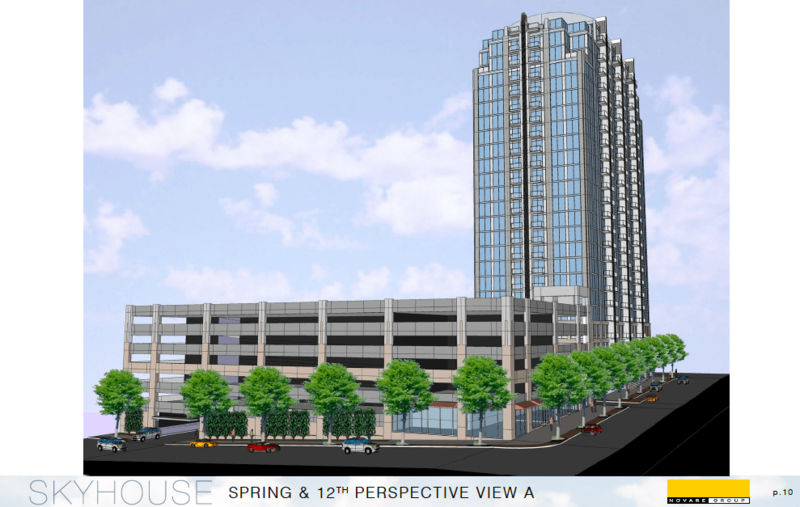 Benedict's exterior design would result in very minimal increases in cost with the exception of maybe the parking deck. The design is not radical nor highly customized, it is just a quality improvement making the building much more presentable. Bravo to you Benedict, it is this kind of community involvement and concern that will hopefully make a smarter field of architecture if we ever get out of this recession. @ KB - Understand that you were trying to clean things up a bit, without making too much of an impact. After all, Novare probably sh*t a drab boring concrete block, when they saw your rendering and had to second guess their design. Personally, I think Novare epitomizes everything that is wrong with development in this city. Their design is thoughtless, they have no concern about minimalizing their impact or fitting into their neighborhoods, much of what they build is speculative, the construction is cheap and it shows, and even after handing tons of properties back to their banks, they continue to build the same drab, boring, mundane buildings they've always built. The only difference this time, being that they actually got the model right and developed rentals instead of condos. Either way, they're a stain on this city. Allowing Novare to continue to pollute the skyline, when I'm sure there are numerous other developer/architects who would love to take on the design and architecture of this project, is bad form. As far as the parking deck is concerned, it's my opinion that parking that affronts the street should not be allowed on buildings any longer. For example, 5 Napkin burgers just built their new building at 10th/Piedmont. Instead of having an attractive storefront that opens right onto the sidewalk and is more visible to the street, and more accommodating the pedestrians, the building is insulated by 20 feet of parking space. It's a handicap to the accessibility, future use, and aesthetics of the city - not to mention the infrastructure, social problems, traffic, and transportation issues. How is this news? You state Kyle Benedict has "no involvement" with the development or developer in any way. This is utterly irresponsible reporting. You can not compare one phantom rendering with the developer's vetted, priced and entitled rendering. Kyle's rendering may be more interesting but it has never been part of the process. It is not an option. Why present it as such? Why present this rendering at this late stage? Are you simply promoting Kyle? Is he related to this blogger? If Kyle wants to be taken seriously, get involved in the development process early on. No more Monday morning quarterbacking in the "press." Great work: the look, human scale @ street level and rooftop pool would no doubt attract residents and possibly command a premium; I think he's dead on in terms of what someone looking for an apartment in Midtown wants. I don't work in real estate, but it sounds like Novarre doesn't understand the explosive, sustained profit power of designs that functionally & emotionally connect with the buyer target...hello, Apple? I am pretty sure what you just did is "Monday Morning Quarterbacking" Regardless it looks like someone p*ssed in your corn flakes this morning. Pricing isnt done by renderings. You wont find a contractor in this world who will legitimatley price a building based off of a rendering (and if one did, it would be a recipe for disaster). If you knew anything about the built environment/industry you would know that. Go back to your p*ss ridden corn flakes and stop acting like a hypocrit. As long as the permit hasnt been filed, and consultants havent been hired its an option. a. mad at this blogger? b. mad at me- the phantom renderer? c. mad at the world? As for the timing... unfortunately I read the original article about skyhouse for the first time more than a month after it was initially posted (that was also my first exposure to WNA). I felt so strongly about it after seeing the design and reading the comments that I decided to design my own version with the intention of showing Novare another option (plus, I just truly love to design). I completed my version in approximately 5 weeks- working on it as my schedule permitted. I felt there was still a chance the design could be used because -based on the article- it appeared Novare's initial proposal was still in the schematic phase. Thanks again to everyone for all the other positive comments. They are great to read and it is even greater to see that most people recognize the bigger picture here. Also, fantastic points in your second paragraph Morningsider. Did 5 naps tear down the old Nikimoto's? I assumed they gutted it and used the existing building bones but just changed the exterior... then again I don't drive past there as much as I used to so don't really have any idea. They might have also gotten away with the setback design because isn't the building "connected" to Zocalo? I'm sure they were able to get grandfathered in some how or some way to prevent them from having to spend more money than they wanted. Speaking of that place... anyone eaten there yet and if so, is it any good? a) About the maximum price that intown Atlanta renters can afford en masse (i.e. lots of new infill in larger developments coming on line together) is $1.70/SF per month. b) About the minimum price that makes a project like this work with financing is $1.70/SF per month. This means that Novare and other developers in the area are walking a fine line on affordability for the market and the ability to attain financing. Too much of a price increase makes it unaffordable for the market, and thus not debt ready. And there is no room to go lower or the project won't work for lenders and probably won't give Novare the levered IRR they are looking for. $1.70/SF is the number. All of this becomes even more complicated in today's market, and even moreso in Atlanta specifically (the possibility of an undersupply does a bit to help, though). Novare is more easily able to work out the numbers and strike up a deal with a lender because it has replicated its successes so many times. It uses the same basic designs, the same materials, the same contractors, builds in the same markets and attracts the same buyers/renters, and this replication allows it to put together a pretty honestly accurate pro forma for the project. Once again, disclaimer: I am going on hunches and my extremely limited knowledge of the process. I sincerely wish and hope that this new design, and even new name, are incorporated somehow because I live 2 blocks away, and I too only want the best for the area. Five Napkin simply replaced Nickiemoto's... I doubt in this economy they were going to spend the money to tear down the old building and build a new on that fronts the street. I will say the corner does look much nicer, but I don't blame Five Napkin for the reason why the original building doesn't hug the street. And yes, it is good (they are from NYC) however you will notice that some of the cheap yokels that live around here will complain it is "too expensive". Whatever, you get a huge burger and it tastes better than Flip, Grindhouse, and Vortex. Love the new design ... much more modern and hip for Midtown. The old design looks too much like Spire, Viewpoint, and Metropolis ... time for a completely different look ... a nice departure from the normal architecture! We pretty much know that the Novare design won't look much better than their rendering, but the alluring graphic quality of KB's design is deceptive and could use several more design iterations. One look at the featured pool deck and immediately I can tell that it won't work. The organization was forced around the placement of the pool. The curtainwall is easily the most compelling part of the project and yet the balconies are short of being fully incorporated into it (see last rendering). Further, he goes on to talk about intimately scaling the street experience, but what about the experience of the tenants? The penthouse terrace butts up against a monolithic blank wall framed by a gigantic geometry. Finally, budget considerations? I think it's great that KB is doing this on his own time, but if you're going to bring your game, you gotta go all in, especially if you're going to use condescending verbage in your "proposal." There's value in humility when you want to win a client. KB- I think what you did was fabulous, if a little pre-emptive. Is it legal to build over the street as in the Pulse design? I can think of a few examples around town but it is pretty rare (except for honky tubes downtown and similar pedestrian bridges). Overall, nicely done. Seems like much of the problem with developers is that they can get their hands on OPM too easily. A few years ago a developer's representative told me that they had just taken a trip to Chicago to understand how condos there incorporated retail. This was a developer that had already completed several residential towers and they never bothered to leave Atlanta to see how anyone else did it? She told me they discovered that their standard design of making retail space as shallow as legally allowed resulted in spaces only useful for dry cleaners and alteration shops and they had a hard time renting out space because of it. Remember, this was after spending hundreds of millions of dollars building towers that they gave any thought to what the street level space should be like. @ JS - You bring an interesting point to the spotlight. As most here know, I've long argued the importance of dense rental housing in urban areas. I've also long argued the role the city can play in supporting that. It's good for economic growth, environmental impact, and future development/progress of a city. This is a perfect example for the city of Atlanta to step in, and help mitigate the cost of development, to foster urban rental housing. They can issue tax exempt bonds, or issue tax credits to help fund part of the project, and require 20% of the units to be "affordable". For all you twits who are about to start crying of section 8, this has nothing to do with section 8. You can structure as anyone who earns below a % (60-80% being typical) of the AMI. Since the AMI is relatively high, this means young professionals on their first job, waiters, bartenders, etc. would qualify. It lowers one component of the development cost slightly, as the 20% affordable wouldn't be finished with the same finishes as the market units, as well. You could spend a bit more on the development, as the project just got cheaper to build (especially if the city issued tax credits that were sold by the developer, who then used the proceeds as equity), to ensure that the aesthetics and the function meet the desire of the end user, as well as the future possibilities for further development, while still preserving the IRR hurdle of the developer. You've added more people to the area, you've increased the demand for nearby businesses and services as a result of those new people, that encourages future development (and future tax revenue), new businesses (and new tax revenue), which if guided appropriately means further densification, which means less reliance on cars, as there is better proximity to nearby goods/services, which translates into less energy usage, per capita, which means progressing towards an era where I don't have to wake up every f'ing morning to another code orange smog alert, and where the city is actually, legitimately deemed a vibrant place. JS- great points. I think it is always hard to put exact numbers to things when there are immeasurable psychological factors that can influence those numbers... I am from the school of thought that someone who has an emotional tie to their dwelling (whether it is pride, status, location, etc.) will be willing to spend a little more on that space. So therefore, spending a little more to build a more appealing building (can't please everyone of course) will be worth the investment. It doesn't always work this way but would people rather say, "yeah i live in that new badass building with all the colored glass and that big white band that goes around the whole thing" or "yeah, i live in that building that looks like all the other ones". As that statement proves, I am a designer and not an economist and will never claim to be. I love to draw, I love to solve problems through design, and that is what I strive to achieve. Not knowing the budget for this I basically used the Novare drawings to restrict my design to those parameters. If you are a resident on the roof terrace, are you looking at the wall or the nearly limitless view in every direction? The wall behind the penthouse terrace I think you are referring to is the stairwell (can I get some credit for thinking about where those go?) and that is actually a bonus terrace that would come off the loft bedroom space. The penthouses were a late afterthought when I had extra space on the roof level... and remember it is rentals, so a two story unit with with large rooftop private terraces with incredible 180 degree views of midtown and buckhead is still pretty damn nice. As for the budget, I had no info on that so I tried to restrict myself to Novare's proposed heights and footprint. Finally, I find it funny you criticize me for not bringing my game "all in", when the closest game to my game is solely everyone's criticism on the original WNA article. Am I missing all the other alternative designs people proposed who brought their game all in and made my proposal look bad? No? I didn't think so. I understand as a "former architect" you are extra critical (I think it's genetic), and I do respect thoughtful and constructive criticism on my design. But to criticize me for what I brought to the table when it was the only thing on the table and also considering it was on my own time for no compensation is a little ridiculous. Is it possible you are a little bitter as a "former architect" that you didn't think to or have the motivation/creativity to do this yourself? Jason- I consider where you think I am building over the street to just be the driveway to the parking deck even though it does access 12th St. as well as W. Peach. If they do change the layout of 12th street maybe that would be something to consider but it is such a short span I don't think it would affect too much. Time to call an engineer! 2) Novare has to make at least a 35% equity contribution in the project, ensuring it has skin in the game. I admit I don't know anything about Novare's capital sources or if it's doing this project in a venture. 3) And the strength of Novare's balance sheets. Does Novare have a net worth at least 100% of the face value of the loan? Does it have at least 25% liquid? The net worth I'm sutre of, but the liquidity I'm not considering the company's troubles with quite a few developments like 3060 Peachtree potentially tying up its resources. Lastly, the land hasn't even gone under contract yet and is still being marketed. This thing is still pie in the sky for all we know. 2. Novare wouldn't have to make a 35% contribution to the project - it and it's equity partners would have to make a contribution, and on development it's typically a lot lower than 35%. Most equity investors account for 80 - 90% of the total required equity, so Novare might be responsible for 10% of the required equity or 3.5% of the total project costs (based on your way too high 35% number)...a far cry from your 35%. 3. Did you just pound your hands on the keyboard this morning? @KB - have you ever heard of the Revision Cloud? It sounds right up your alley - http://therevisioncloud.wordpress.com/. Speaking of humility. It clearly shows that you lack any whatsoever to assume that your input is somehow higher than others. The pool would work with no problems, so as far as your critique on that you do "know" it wouldn't work. In fact you don't "know" if anything will or wont until you see construction documents, which are not being presented here. Its called "design development" and I would assume that someone who claims to know as much as you do would be aware of that. The so called issues you point out (penthouse abutting a blank wall) are minor in the grand scheme of things and would take minimal effort to change. It is clearly not a make or break deal to this project. So as far as this building not working, you have no tangible proof or evidence that it wouldnt. This is a quality design, which would have to be tweaked just like any would in its early stages. Budget concerns? This design does not add any radical (not a pun on your name KB) design elements that would vastly alter the cost of this project. In fact to offset that KB offered opportunities for additional revenue with the retail and restaurant space. If you were truly an architect (and if you are its only in relative terms) you would have offered up a constructive criticism or design solution to the minimal issues this building faces. My guess is that the way you critiqued this design is the exact reason you are unemployed. Take your bitterness elsewhere and let those that care about the future of Atlanta explore their ideas. KB- Wow, personal jabs. Thanks. By including the rendering of the closeup of the pool, you opened yourself up to criticism. The scale was begging for more detail regardless of the design stage. I simply wouldn't have included it in the proposal. I would also consider how utterly unprofessional the proposal was. No, I'm not a fan of what you presented, but I am a proponent of designers pushing better ideas out in the community, which I thought you were on the right track for. That said, designers could benefit from a little humility. JonC- Hadn't heard of that of that site but I love it after checking it out. Thanks- Atlanta needs more of this! BCATL- Thank you, you summed up a lot of my thoughts. Felix- I am glad you are a proponent of better ideas. I have plenty of humility... my presentation probably was borderline unprofessional. But, I am one guy working out of my apartment... I don't have a marketing and PR department. I was hoping my design would speak for itself, so I probably shouldn't have included any text except my phone number. But, my passion is design... and sometimes my passion for that spills into my thoughts on other things as it did in the presentation. I wrote that presentation exactly like I would speak to someone in person and anyone that knows me can attest to that. Unfortunately sarcasm and humor in vocal conversations often don't translate very well to words on paper without sounding offensive, and occasionally that is my downfall (oh and the fact that world is way too sensitive these days). As for personal jabs? You can critique my design and presentation all you want and to that I will either agree with some of your criticism and/or defend my design as I see fit. When you criticize my work ethic by claiming I did not go "all in", you are making a personal jab at me and I will defend myself appropriately. Your blog states you are a "former architect"... did I quote and overstate that multiple times for effect? You bet I did. That is because an architect would recognize the stage of development this project is in and would not criticize such minute details as you did. AND, if they did choose to bring up those small details, they would not say it in the condescending know-it-all tone that you did and BCATL referred to (so I know I am not the only one that picked up on it). So, if you are going to give it, expect it back. Besides, you look like a pretty tough guy in your wife beater, so I assume you can take it. Oops, was that another personal jab? KB - I think that your preliminary design is sharp. Having said that, it's funny how much you all are enjoying lecturing another company about how to develop their projects and spend their money and resources. There are plenty of empty lots in Midtown (Downtown and Buckhead for that matter.) if you think you have a better mouse trap -- go for it! One other thing: isn't this lot very close to the Marta tunnel? That might inform the underground parking situation. Not sure but just a thought. 1) The lender will make a return on a solid loan. A solid loan is backed by a solid market and a solid company, as well as a solid project. The market plays a huge role. A small bank putting out a huge construction loan, thereby screwing up its balance sheet on maturity and on the actual balance of assets to liabilities (deposits), is at risk moreso because of the market than anything else. The markets are what killed the small banks this past go around. They weren't securitizing these loans and were on the hook for more than they could actually bargain for. They were making loans on projects that made no sense for the markets. The project failed and whoops, what's a write down on 20% of total assets? A failed bank. Now the small guys are wiped out, and the large guys are opening up the spigot ever so slowly on construction loans, because their balance sheets have improved dramatically and they have increased their deposits. They are still being careful on which markets they are active in. Atlanta is still on the border of safe or sorry. In addition to complete write downs, there are/were plently of refinancings. This means the developer is hurting most likely either because the project was complete bunk or the market could not support it, but it also means the bank will take a hit. A solid market for this type of project will mean that the lender is able to make a good return on its loan and will hit few speed bumps on the way. 2) The LTV may be 70% and the equity the remaining 30%, as an example. Of that 30% Novare needs to put up its own 35-50%. The rest comes from however Novare structures its deals. Maybe Novare puts in a full 100% equity contribution, meaning no outsiders on the equity component. That's probably not likely in this situation. Hopefully this clears up what I meant by lender needing a good return and Novare putting up 35-50% equity contribution. Underground parking in many parts of Atlanta, the Midtown/Downtown areas not withstanding, is very tough due to the type of bedrock. Atlanta developers must combat I believe granite, which is much tougher than the bedrock in DC. DC is built on borderline swamp land, and so all of its garages are easily hidden. FL is actual swampland, so there aren't many basements and underground structures. Atlanta is a mixture of clay and (I believe granite), so even if a site is mostly clay and a little bit granite, it is far too cost prohibitive to build underground. A simple above ground parking garage may cost $20,000 a spot in this particular area. I could not claim to even have an estimate on the cost of underground parking or elaborate garage designs, but it ain't cheap. Land is cheap, but it's not like the developer can charge $3.00/SF for rent and make an enormous return. Plus, if we could support rents that high, whether it be office or multifamily, land would not be that cheap! I just wish they would start building it already! @ JS - You're a broker right? Just trying to understand your total lack of comprehension. When you said, verbatim, "Lender needs a good return on the total cost and will only get this return through the strength of the market", you were way off mark. Yeah, the market plays a role, but it's by no means the most important - good operators exist in bad markets, and run phenomenal properties. Lender's don't earn a return through the strength of the market, they earn a return through sound investments in credit which encompass a whole host of variables, including, but not limited to, the market. The markets (since we're talking about individual MSA's here) weren't the catalyst to the banks failures a couple years ago. That's a common misconception that uninformed people have about 2008, as well as about the great depression. Interest rates that were far too low, speculative building, unconstrained and imprudent lending, and a mis-alignment of incentives, all of which fueled an unsustainable bubble were why the banks failed. If it weren't for this poor evaluation of credit, perverted incentive structure, and poor management of monetary policy at the federal level, these "markets" could have had price corrections and the banks still would have been ok. Bad markets are the consequence of other actions not the catalyst. I'm not sure who you're structuring deals for, but they're getting the short end of an ugly stick. Novare, and every other developer out there targets an IRR that is above the cost of equity - which therefore makes it smart for them to put in as little equity as possible. 35% - 50% is WAY to high for anyone, as the usual number is around 10 - 20% of the equity requirement. Maybe this is why so many of Atlanta's projects become flops - because they have Johnny Simmons structuring their capital stack. Re: Parking - there's no reason that, given how many vacant lots there are in the city, building owners can't sign leases with lot operators. There are plenty of other ways to provide parking than by building massive, ugly, economically destructive lots. Find me an investor with a few (hundred) million to throw around and I will gladly stop suggesting better looking, more thought out developments and save those ideas all for myself and that investor. As for the lecturing, isn't the internet strictly for complaining about everything in life and showing people how to do things better based on our own two cents? I think MARTA runs far enough East of that site to not affect digging underground but don't quote me on that. I'm not a broker and I don't work for a developer, please let's not misconstrue me. I'm just comfortable using my name and opining. Urbanist, from a technical standpoint, a rental high rise IS a massive spec building as there is no guaranteed demand for or tenant before construction finishes. This is where mini-perms come in, and this is precisely why markets play a HUGE role in determining if a bank will finance the construction and lease up of a 24 floor rental building on West Peachtree in Atlanta. The maturity on these types of loans is really short, providing a unique risk to the lender and obviously to the developer. The lender has to balance out the maturities of all of its loans and can't just issue an $80M 24-month contruction loan and mini-perm without working out all of its ratios. The developer has to be able to pay back the loan, which is contingent on rapid lease-up and stabilization of the property, which is contingent on the market. Otherwise the developer might be forced into bankruptcy and the lender could be in some real trouble, too, as we have seen. And in this sense the community and regional bank failures have been extremely market specific, with Atlanta practically on top! Regarding multifamily high-rise construction loans and mini-perm loans on multifamily properties, I would guess that given the risk and size of the project, and because major banks are now just reluctantly making this sort of credit available, markets with proven and time-tested high-rise rental histories will get the most love from the traditional sources of financing. If I had to guess, knowing that lenders, life companies, and institutional investors red-line smaller and untested markets, Atlanta is considered a smaller rental high-rise market compared to other cities. If I were a lender, without knowing anything about the urban multifamily markets of either city, I would rather finance the construction of a 24 floor building in Seattle than Atlanta, and I sure as heck would feel more comfortable financing a similar project in Chicago, DC, Boston, or NYC. Someone in Atlanta will have to do some convincing for me to give that market a shot, in other words. I think fortunately, Novare is probably one of the best local groups to pitch the deal to lenders (and I know they were using 3rd party support for this at some point). In addition to this, a unique market driven negative of Atlanta stems from our recent condo boom. It's still technically cheaper for many people to finance a condo than to rent an apartment in intown Atlanta, so there's one knock on rentals. Another knock is that now we are seeing more and more of these masses of unsold condos rent out. They tend to be on the high end, but once prices come down, a $1700+ 2-bedroom in Sky Point, which is in a more isolated area of Midtown, suddenly becomes less and less attractive compared to other units being rented out in other buildings. I also don't think you're understanding me on equity constributions, but that's ok. We're actually on the same page; I'll just leave it at that. That's a good idea. I just question the amount of covered, reserved, safe parking a lot operator can provide a rental high rise or office building. Once again, in certain markets like DC, Boston, Philadelphia, and NYC, developers can get away with providing a much lower parking ratio, both from a regulatory standpoint and a market driven standpoint. Here in Atlanta, even if we were to double MARTA service to more areas, our intown parking ratio would still be quite high due to our affinity for cars and the "cheaper" and more abundant land that makes providing parking easier. Looks like these buildings are already in Lenox Park. And FYI, no matter how nice you jazz up apartments, in Atlanta, they will soon become section 8. Look at Park towers, which is in a much nicer area. "Find me an investor with a few (hundred) million to throw around and I will gladly stop suggesting better looking, more thought out developments and save those ideas all for myself and that investor." Exactly my point -- if you don't have the money, stop preaching to others about what to do with theirs. "As for the lecturing, isn’t the internet strictly for complaining about everything in life and showing people how to do things better based on our own two cents?" Not strictly -- but complaining does have its charms. Classic Clicker Commentary - criticizing the guy who has an idea and wants to offer his ideas in the hopes that perhaps they'll reach the right audience and enact some sort of change. Under your guidelines, anyone large on ideas and short on cash should be marignalized. If an entire city thought as simplistically as you did, and was as weak willed as you were, we'd have a city of bland architecture run by only a few firms...Oh, wait a minute. There's value in ideas, and there's value in discussing ideas, particularly if they present an option to do something different. Just because you're short on ideas, doesn't mean the people that aren't shold be bashed for having them. I am overwhelmingly starting to agree with Urbanist on this matter. Look at these multifamily developers and what they build in other cities compared to ATL its night and day. AMLI is a great example they have great urban apartments in NYC but build suburban style crap complexes here, even intown. Post is another example, to a lesser extent. The land costs here are a fraction of these other cities and the developers are in the land for so little, financially they should be able to take some great risks and build some great buildings but for some reason they just don't. It seems as though they demand a higher profit margin to build in Atlanta than they do in other cities, perhaps because rents are so low? Funny KB, I was thinking that all of you advocates of centrally planned economies need to move to China! 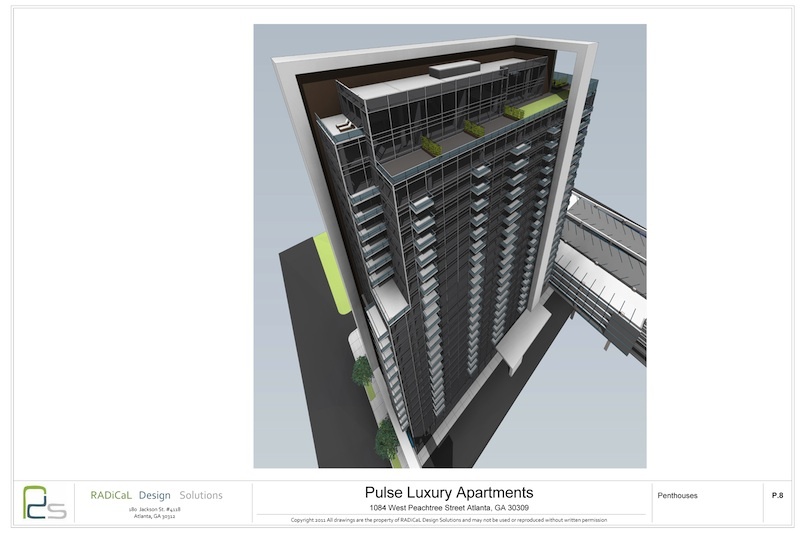 If the market thinks that Atlanta demands plusher apartments, some developer will exploit that. If the market thinks that more street level retail is needed in this area (has anyone noticed the retail vacancies in this part of town or do you people drive through blind-folded? ), some developer will exploit that too. Pontificate all you want about what a developer should do and shouldn't do; that's easy when the money is not yours. And yes Urbanist, anyone large on ideas and short on cash should be marginalized. "You speak of the “market” as if it is some sacred oracle that gives us the secret to successful real estate..."
Now you're getting it KB. By the way, you may have missed this but I did complement your design. I hope the 'market' gives you more chances in the future. Actually, I did notice that but got caught up in this lively debate without saying thank you. I do appreciate the support. The redesign looks very Perkins+Will if you ask me. Christopher- I'll take that as a compliment.